The Tennessee Court system today completed a multi-year project to install trial court case management software in court clerks offices across the state. The Tennessee Court Information System, called TnCIS, provides clerks with an automated case management system that reduces paperwork, processes fee collections and improves record keeping and timeliness of case management. The TnCIS system helps clerks efficiently manage the courts time, while also providing more uniform and accurate court data thats more easily accessible to the public, law enforcement and other state agencies. The software has been implemented in 151 locations statewide, including today's final installments at the Campbell County Clerk & Masters office, the Loudon County Clerk & Masters office, and the Union County General Sessions & Circuit Court Clerks offices. The TnCIS project replaced legacy case management systems and automated 32 offices that were previously relying on paper record keeping. Thanks to the TnCIS project, more than 95 percent of court clerks offices in Tennessee are now using computerized case management software. 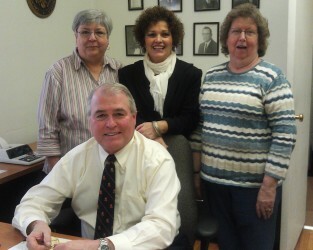 Loudon County Clerk & Master, Fred Chaney, and his staff, during their TnCIS installation.